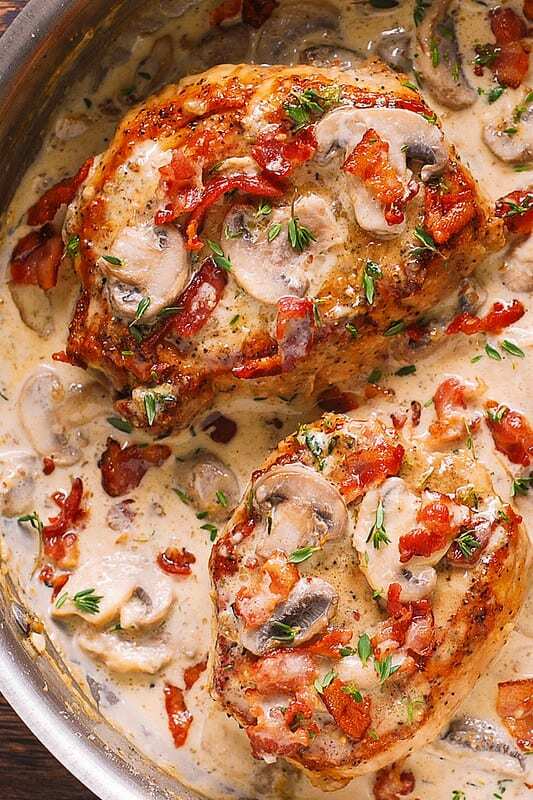 One-Pan Smothered Pork Chops with creamy mushroom, bacon and fresh thyme sauce. Use boneless pork loin chops. Everything is cooked in one large skillet. Easy recipe. Minimal cleanup. Low carb, high fat, KETO friendly, gluten free recipe. Tender and moist texture, forget dry pork chop meat. Pork chops are a great cut of meat that can taste really good but they can also be easily overcooked and result in a tough, dry meat. 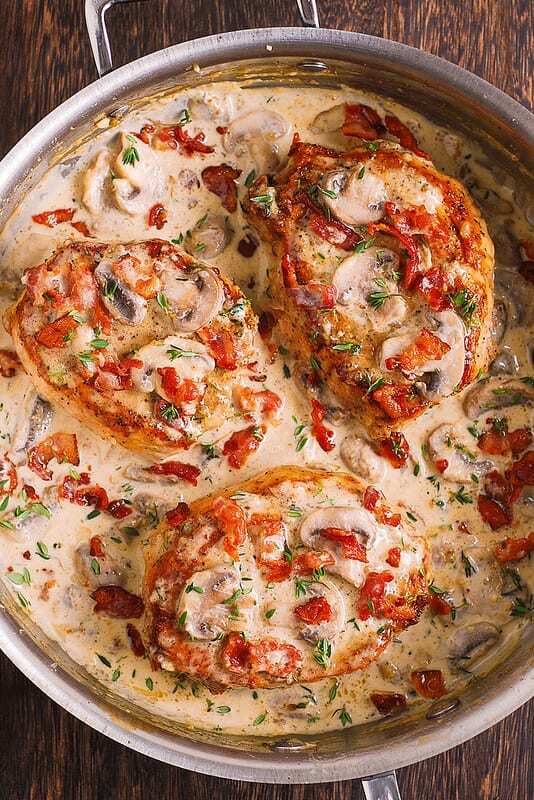 Enter these smothered pork chops. 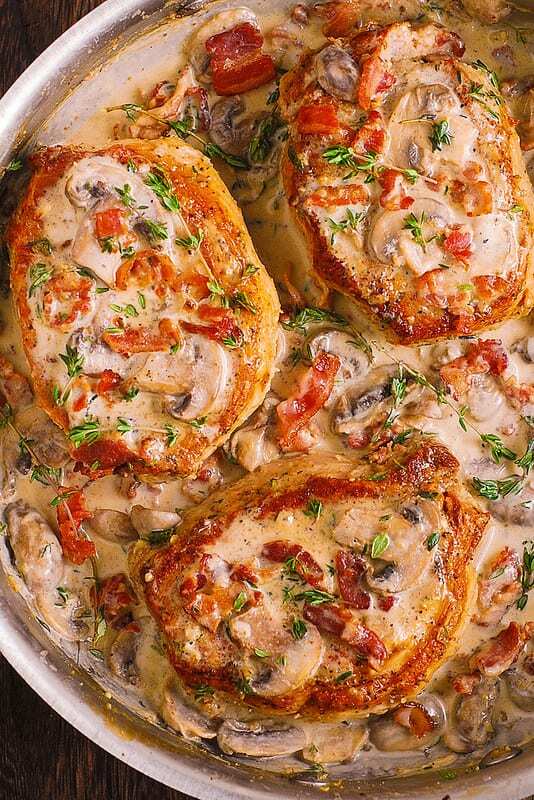 Covered with mushrooms and bacon and a cream sauce with lots of fresh thyme, your creamy pork chops are guaranteed to be tender and moist, and not dry at all. Even if you do overcook them a little, you won’t notice it thanks to the creamy sauce. Use only one pan. That’s right! 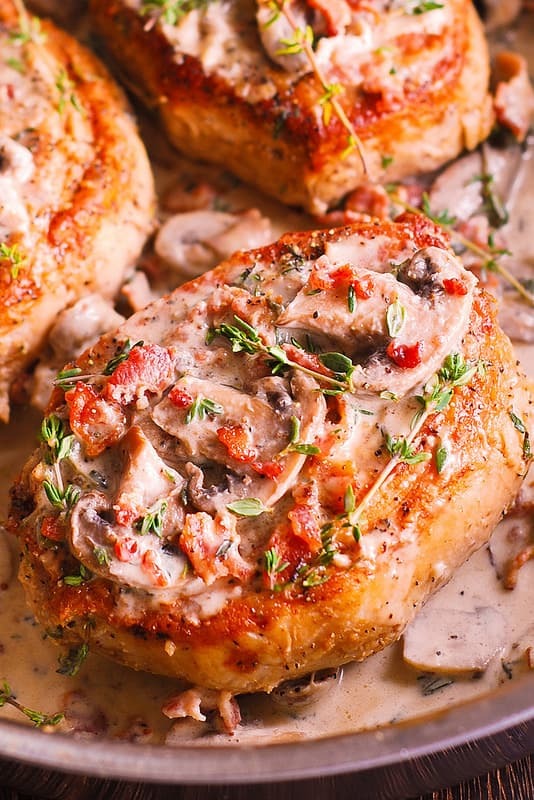 You use one pan to make these smothered pork chops which minimizes the cleanup. 30 minutes cooking time. It’s a great recipe for a busy person who wants something easy that tastes like comfort food and looks like something from a good restaurant. KETO friendly recipe. This recipe uses ingredients that are high in fat, high in protein, and low in carb. Perfect for those who follow KETO diet. Omit flour for KETO friendly version. Gluten free recipe. Use gluten free flour to make this recipe gluten free. In fact, I’ve made this recipe with gluten free flour because I am gluten free. I use heavy cream. You can also use cream of mushroom instead. I use regular white button mushrooms. You can also use cremini mushrooms, portobello, shiitake. This recipe contains heavy creamy and bacon. All these ingredients have high fat, low sugar content. Mushrooms are low-carb and a great way to add flavor to keto recipe. Pork chops are high in fat and high in protein, yet low in carbs. A perfect KETO friendly ingredient. Omit the flour. To make this recipe KETO friendly, simply omit 2 tablespoons of flour for browning the pork chops. Because there is so much creaminess and so much meat in this recipe, I suggest that you serve simple cooked spinach, or steamed asparagus with this dish. Or other cooked greens. Mashed potatoes, or easy scalloped potatoes are also great side dishes to go with these smothered pork chops. I also suggest that you try this really easy Asiago cheese roasted broccoli recipe – you can roast the broccoli in the oven while your creamy pork chops are cooked on the stove top and you can use any cheese you like, such as Parmesan cheese, not just Asiago. Boneless Pork Chops in Creamy Garlic & Herb Wine Sauce – one skillet dish ready in less than 30 minutes! Made with dry white wine, juice of a fresh lemon, garlic and thyme, these pork chops are super juicy and packed with flavor. 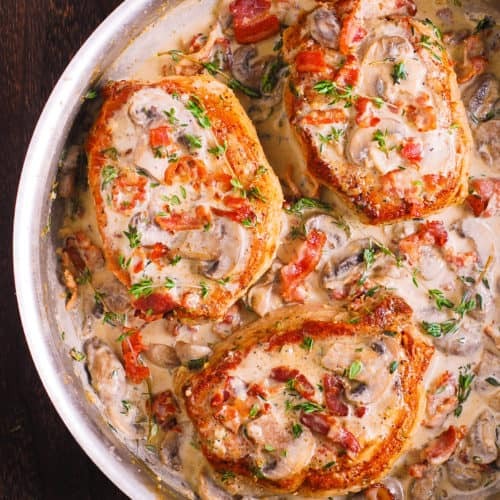 Boneless Pork Chops in Creamy Irish Whiskey Sauce – simply sear the pork chops in the pan, toss with mushrooms and smother with a delicious creamy sauce with Irish Whiskey and a bit of Worcestershire sauce! Chop bacon into smaller bites. In a large skillet, cook on medium heat until the bacon is cooked. Remove bacon from the pan to a plate, leaving the fat in. Season pork chops with salt and pepper. In the same pan, on high-medium heat, cook pork chops 4 minutes on each side in bacon fat, until nicely seared. Reduce heat to medium midway through cooking. Remove the pork chops to a plate from the pan. Add sliced mushrooms and minced garlic to the same pan. If needed, add 1 tablespoon olive oil. Season with salt. Sprinkle with fresh thyme leaves. Cook on medium heat for about 5 minutes, stirring, until mushrooms soften and release juices. Sprinkle 2 tablespoons of flour all over the mushrooms, and stir the flour in on medium heat. Add chicken broth and raise the heat to bring to boil, constantly stirring. You should have a smooth slurry from the flour and the chicken broth. Add heavy cream and stir it in while boiling until everything is smooth. Then reduce heat to low. Add back the pork chops and the bacon. Cook on low heat, covered, until the pork chops are cooked through. 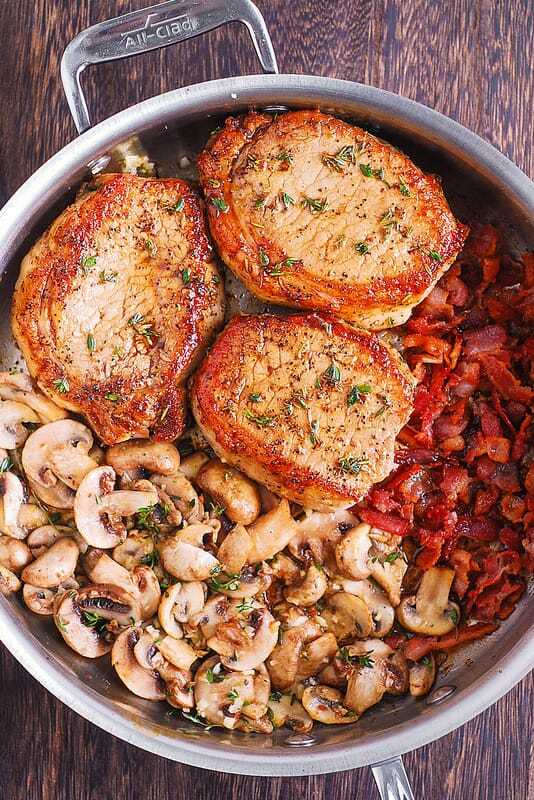 To serve, top pork chops with mushroom and bacon mixture and with more fresh thyme leaves. Wonderful wonderful!! Love how the flavors Pop! Cut the recipe for 2 and it came out scrumptious. I will be making this for company in the near futur and I know it will be a hit. Thank you for your recipes!!! This was so yummy! I replaced the flour with a 1/2 tsp of Xanthan gum & it came out great! I’ll try this tempting recipe tonight! What would the carb count be without the flour? I added Brussel Sprouts sliced into quarters while I cooked the bacon up. It was a great way to make it a true one pot meal! Can we use cornstarch to thicken the sauce?. For Keto. I am new with Keto. You should try using xanthum gum. It works well and is keto friendly. yum! My husband and I enjoyed this. I kept it Keto without flour but it would have been nice to thicken up that sauce – I just didn’t have any keto alternatives oh well! Still tasty. It was great with a side of spinach, that sauce makes the greens super good! Thanks! Xanthum gum is amazing for this!! I just finished cooking these and I am enjoying one now…YUM! Thank you so much for sharing this wonderful recipe it’s a keeper. So glad you liked this recipe! Thank you for such a kind comment! What do you recommend for a side or vegetable?